Home » Anxiety » Chronic Skin Symptoms – Look for Stress First! By now, you’ve probably figured out that the skin wrapping your body is serviced entirely by the nervous system. Therefore, chemical imbalances related to mood disorders can cause reactions in the skin, even chronic skin symptoms. 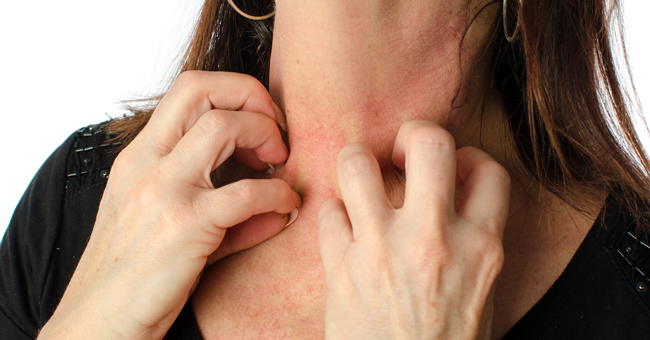 Some chronic skin symptoms are itchy (such as eczema), annoying (like acne), dangerously contagious (like herpes), or extremely painful (like shingles). Psychodermatology addresses the relationship between an individual’s emotion and how it relates to the skin. Rather than just addressing the dermatology side of the equation, researchers and doctors are finding that so many of these issues are related to the “mind connection.” Through an integrated approach, psychodermatology allows for new treatments such as antidepressants, relaxation therapy and counseling with a qualified psychiatrist or psychologist. The skin is our bodies’ first line of defense and every day it is bombarded by bacteria, viruses, fungi and others that are constantly present in our environment. Herpes Simplex and Herpes Zoster (shingles) are common skin infections, which can be painful. Normally, when we are healthy and at peace, our immune system can ward off the vast majority of infectious attacks, even the bad guys with the “simplex” names. Ongoing stress, depression and anxiety, however, can wear down the immune system and leave the skin more vulnerable to whatever microbes happen to land on it. When the immune isn’t functioning properly, the patient is not only subjected to greater suffering, but runs the risk of the condition becoming chronic and systemic. Even something as normal as an acne breakout in teens or adults can be directly related to stress. When you’re suffering chronic tension, your body release stress hormones that are directly related to the skin’s oil production. At the farther end of the scale, doctors are finding that auto-immune diseases such as lupus are STILL directly related to stress levels, and the body’s “attack” on healthy cells occur far more regularly when that individual is under chronic stress conditions. The best treatment is prevention by maintaining the balance of neurons that supply the skin. If you have chronic, recurring and otherwise unexplained skin symptoms, assume there is a neurochemical imbalance somewhere behind that symptom. My goal is to treat it as such until or unless proven otherwise. There is nothing to lose – and potentially a lot to gain – using the diagnostic treatment approach to ongoing skin conditions. Call me at (949) 481-0118, or complete our online form to discuss your symptoms. Imagine clearing these issues from your system!